My Wandering Life: Summer Staple: Day Camp! 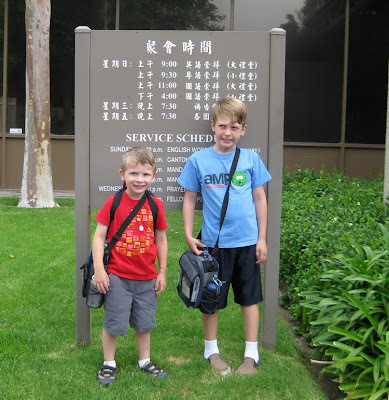 The boys get to go to day camp this summer and this is their first week. Although it's not the same as the first day of "school", I still felt the need to get the obligatory "first-day-of" photo. At the camp, they get a Chinese lesson every day and they are proudly showing off their ability to write a couple of characters each night. Giving them a head start for Macau, I suppose. Here they are with their new lunch boxes. Ben has been snuggling and napping with his for several weeks, asking me every day if it's finally time to use it. I got him a backpack for school, too, but I think he might have a seizure from excitement if I give it to him now, so we are waiting! I hope his enthusiasm for school continues once he actually starts it!